Which way will New Zealand First jump? How relevant will Peters treat his own party policy to his final decision? In the election aftermath, where is New Zealand First headed? Subliminally, it would like to go centre-left. How do I know this? Well, when you click on the New Zealand First policies the first panel that comes up on the top row left is Transport, and it has a picture of a bus on it, and that bus is headed to…Aro St. Say no more. Sure, a few nitpickers will say that this evidence of NZF’s directional compatibility with the spiritual home of James Shaw proves nothing at all. True enough, it is also clear as mud as to what extent Winston Peters regards himself as being the humble servant of the NZF policy manifesto. Much of it, you’d guess, will not see the further light of day. Also: he may not (merely) have utu in mind, as some in the media have claimed. But if you were a betting person, you’d still be putting money on the likelihood that the country’s sixteen charter schools – the offspring of Act’s much loathed David Seymour – are not long for this world, either way that Peters jumps. • Require government and council vehicles to be 100% zero emission by 2025/26 (with exemptions for emergency services and NZDF). • Initiate a Public Inquiry on the future of conventionally powered motor vehicles — to put in place what we need to have mostly zero emission vehicles by 2050. • Electrify rail with a spur to Auckland International Airport connecting it to the network. • Establish accessible public transport for people in all major population centres with accessible ‘flexible transport services’ operating in smaller centres. ….Develop Railways of National Importance (RoNI) backed by full electrification. Re-instate the Gisborne to Wairoa rail line and upgrade other lines. Build a rail spur to Auckland International Airport connecting it to the main trunk line. Sure, there are sticking points. The centre-left would have problems with NZF’s dingbat desire to relocate the Port of Auckland to Northport (near Whangarei) over the next ten years. But then, so will National. • Increase the minimum wage to $20 per hour over three years starting in 2018 (with tax assistance for employers). • Remove secondary tax for workers with more than one job. • Abolish the ‘starting out wage’ for young people. • Set Minimum Redundancy provisions based on twice the normal contractual notice period up to a maximum of 13 weeks. • Amend the Companies Act so that wages and salary, including holiday pay, have equal priority with Secured Creditors. • Introduce paid paternal leave of two weeks rising to four weeks. • Support increasing paid maternity leave to 26-weeks. • Review and amend employment laws to ensure that casualisation employment practices are fair and just with a review of short term employment contracts. • Put New Zealanders first for jobs by sensible immigration policies. • Pay the Job Seekers Benefit to approved employers when taking on an apprentice. • Paid internship programme to provide work experience. • Introduce literacy and numeracy skills package for workers…. • Require transparency when public service salaries exceed accepted public service bands. To repeat: the centre-left seems closer to NZF than does National on most of those points. Conversely, neither Labour or the Greens would support NZF’s plan to cut back on the “bureaucratic excesses” of the Health and Safety Act. But that could be negotiable. • Establish a new low fees state-run KiwiSaver option – KiwiFund – to invest in New Zealand land, assets, enterprises and infrastructure. • Make KiwiBank the government’s official trading bank. • Re-establish a state-owned insurer to be called KiwiSure to operate at a retail and commercial level. • Introduce Government-backed deposit guarantees for majority New Zealand-owned banks. • Stop the sale of land and farmland to foreigners. • Seriously strengthen the Overseas Investment Act to prevent vertical integration or the loss of strategic business assets. • Remove GST from the non-service component of Council Rates. • Initiate a review into the double-taxation of ‘tax like’ instruments. • Amend (from 1 April 2018) Capital Limitation rules in the Income Tax Act to treat seismic strengthening as “repairs and maintenance”. o Reduce Company Tax rates over three years to 25%. * Introduce Research & Development Tax Credits starting at 125% in the second year when a company invests 2% of its revenue on research, rising to 150% for the third consecutive year and 200% from year four onwards. *Give shareholders of large companies, including cooperatives, a ‘Say on Pay’ for directors and CEO’s, introduce minimum holding periods for executive share schemes and crack down on ‘golden hellos’ and ‘golden parachutes.’…. *Crack down on corporate tax avoidance and base erosion especially with e-commerce providers like Uber and Amazon. *Impose stiffer penalties for evasion and similar offences. *Introduce, as the UK has recently done, two new criminal offences ‘failing to prevent the facilitation of tax evasion’ – whether done domestically or offshore. *Double the criminal penalty for evasion offences to ten years per-offence. *Increase the fine for evasion offences ‘from up to’ $50,000 to $5 million per-offence. • Promote diplomacy as the first option to resolve international conflict. • Remain strongly committed to New Zealand’s anti-nuclear policy. • Continue to advocate against the exploitation of Antarctica and for the cessation of all whaling. • Oppose investor-state dispute settlement (ISDS) provisions in bilateral and multilateral agreements and by extension the Trans Pacific Partnership-11, which offers little for our exporters. • Revise current FTA deals being negotiated to make sure they are real and are in our interests (such as protection of land and strategic assets). • Renegotiate existing poor-quality deals to increase their quality and benefit. •	Conclude the Russia-Belarus Kazakhstan Customs Union Free Trade Agreement as a priority – that bloc being the world’s number two dairy and beef importer. •	Initiate public diplomacy in countries we want Free Trade Agreements with in order to win their public over and secure a better deal for their country and especially, ours. •	Prioritise free and fair trade deals with Japan, United Kingdom, EU and the United States.. Establish a public health compact stipulating the guaranteed minimum services the public can expect from the public health system and its overlap with the private sector. • Ensure the nationwide health screening of all children under one year. • Provide dental care to every pre-school and school child. • Improve residential services for people who have severe illnesses or disabilities and/or substance abuse problems. • Support the investigation of a third Medical School at Waikato University and increase the number of medical professionals choosing to be General Practitioners, especially in rural areas. • Fully fund palliative care services. • Explore options associated with boosting uptake of private health insurance, including the provision of tax rebates for those with private health insurance. )• Ensure the transition to Electronic Health Records so that PHO’s, DHB’s and private providers have access to patient records. • Establish and implement a national strategy for addressing cancer treatment. • Fully fund and provide world leading maternity-care services (especially in the regions). • Develop a national rural and provincial health services plan. • Adequately resource elective surgery and provide additional waiting times funding so as to firmly establish guaranteed maximum waiting times for a range of surgical and specialist treatment. Introduce three annual SuperGold Health Checks with a GP. • Replace National Standards at Years 1 to 8, with children’s progress and achievement being assessed against level bands within the New Zealand Curriculum. • Repeal the amendments to the Education Act 1989 that allowed the creation of Charter Schools at the same time as reviewing Section 156 of the Designated Character Schools section within the same Act. The moves to address the palpable funding and organisational needs in early childhood education would also be welcomed by the centre-left – but could be grudgingly accepted by National. If it was taken seriously, NZF’s policy package certainly looks more like a centre-left document than a National one. However, it also looks more like the wishlist of a party in opposition, rather than a pragmatic document for a party in government. That’s an important distinction. Peters is not going to get all of this, and would not expect to – if only because the bill would be unaffordable for a government of any stripe. Moreover, these coalition negotiations will not start until October 8th, and yet will have to be concluded before October 14th. That means there won’t be time for the policies to be argued line by line. That’s why… while the tone and content of the NZF policy package proved useful in luring voters, it is likely to be jettisoned during this next stage of the journey. 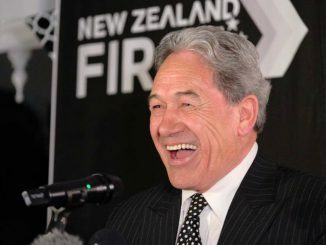 The unenviable task for both the centre-left and National will be to speculate on what in this policy grab bag is truly important to Peters – and what gains he would regard as (a) sufficient to appease his core support, (b) reasonably achievable over time, and (c) being safely able to be left to others to implement, given that (d) Peters himself is likely to be out of the country a lot of the time in future, while plying his trade as Foreign Minister. Red or blue? At a wild guess, I’d say the NZF chameleon was more red in the policies that it put up during the election campaign but is more likely to turn blue by the end of the coalition negotiations. Which means we’re probably facing the 1996 outcome, once again. Meaning: Peters has run against the current government in the campaign, so as to be all the better placed to join with it afterwards. Finally, there was a 1960s soul group called the Winstons. Their big hit contained a line about how we all now belong to the man with that big wide grin… and boy, do we ever.